Busan, a bustling city of approximately 3.6 million residents, is located on the southeastern tip of the Korean peninsula. 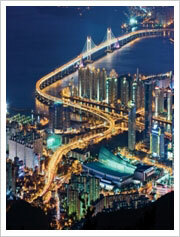 The size of Busan is 765.64 ㎢ which is 0.8 % of the whole land of the Korean Peninsula. The natural environment of Busan is a perfect example of harmony between mountains, rivers and sea. Its geography includes a coastline with superb beaches and scenic cliffs, mountains which provide excellent hiking and extraordinary views, and hot springs scattered throughout the city. Busan is the second largest city in Korea. Its deep harbor and gentle tides have allowed it to grow into the largest container handling port in the country and the fifth largest in the world. In the coming years, capacity is set to grow further with the opening of the New Port. The city's natural endowments and rich history have resulted in Busan's increasing reputation as a world class city of tourism and culture, and it is also becoming renowned as an international convention destination. Busan successfully hosted various international events such as the 14th Busan Asian Games, the 2002 FIFA World Cup Games and ITU Telecom Asia 2004. Through successfully hosting 2005 APEC Economic Leaders' Meeting Busan advanced itself as a logistics hub in Northeast Asia. 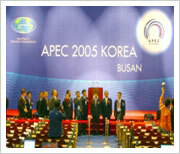 20~30 APEC-related meetings and events, including the annual Economic Leaders' Meeting and ministerial meeting held throughout Korea in November, 2005. Leaders from 21 Asia-Pacific economies attended the Economic Leaders' Meeting. Also, Approximately 6,000 domestic and overseas personnel including government representatives, business people and press participated in the event. Geographically, Busan has the Straits of Korea to its south; Ulsan to the north; Gimhae to the West. Cities that share almost the same latitude with Busan include Jinhae and Gwangju in Korea, as well as Tokyo, Jeongsen, Algiers and Oklahoma City abroad. It is eight hours ahead of UTC. As for its geopolitical location, the city comes at the Southern tip of a strip that connects Asia, Siberia and Europe. It also serves as a main gateway to the Pacific Ocean. This location places the city at the center of international sea transportation. Busan is located at the southeastern most tip of the Korean peninsula and in the mid-latitude temperate zone, which has seasonal winds. It has four seasons: Spring, Summer, Fall and Winter. The annual average temperature is 15 ℃. The annual average precipitation is 2,397 ㎜. Busan has strong winds compared to other areas in Korea. The average winter temperature is 3.8 ℃. 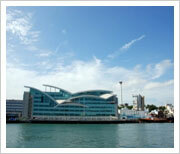 Tourists can enjoy Busan throughout all seasons thanks to the nice weather and beautiful scenery. In summer, the city is crowded with visitors who come to enjoy the beautiful beaches. Shinsegae Centumcity is as big as ‘Harbor city’, Hong Kong and ‘Roppongi’, Japan. It is located only 10 minutes away from the congress venue. This is the biggest department store in the world with 298,905 ㎡ of shopping area. Shinsegae Centumcity is the home to the most prestigious international luxury brands as well as more than 680 different brands. It is also a place of relaxation and endless entertainments with its Spaland, Ice link and Theater. All this within the heart of Busan. The size is as big as Harbor city, Hong Kong and Roppongi, Japan. It is located only 10 minutes away from where the congress will be held. 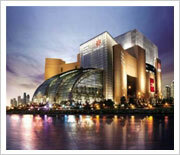 The biggest shopping center in Korea where has 298,905 ㎡ of department area! The main department store has international luxury brand collections as the biggest shopping center, and there are over 680 different brands. Above all, it has hot springs for relaxation in the middle of the city, a spaland, ice link, and theater are also combined in the shopping center that provides endless entertainment. Relax will enjoying the view of Centum’ beautiful river and park at this popular hot spring. Spaland offers various Traditional Korean and Japanese health baths for you to indulge in. The popular hot springs for relaxation where you can enjoy the view of beautiful river and park. You can enjoy Korean traditional bath and Japanese bath at the same time in the two kinds of spring water that is good for your skin and pain. Since its inception in 2005 as a cutting-edge "Multi-Media Marine Fireworks Festival" celebrating the APEC Economic Leaders' Meeting, the world-class Busan Fireworks Festival celebrates its 6th anniversary this year. 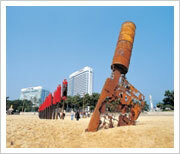 The two-day festival to be held on October 22th, 23th 2010 overwhelms Gwangalli beach. Around evening time after sunset, the fireworks start with countdown at the beach. 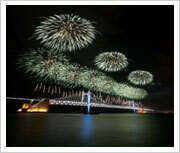 The Busan Fireworks Festival, showcasing nearly 85,000 fireworks, state-of-the-art laser lighting and magnificent music against the stunning backdrop of the sea, night sky and Gwangan Grand Bridge, will surely present memories and hopes that will continue to last in the minds of the 1.5 million spectators. Display of the world's longest "Niagara Falls" fireworks, rising phoenix and etc. Despite its short history, the Busan International Film Festival(BIFF) has grown into one of the most influential film festivals in Asia, filling Busan with famous film makers, actors, critics, fans and huge audiences. BIFF is primarily focused on Asian films, but films are screened from all over the world, including North America and Europe. This enables movie fans to gain a comprehensive perspective of all the major movie trends. 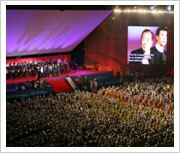 The films are screened at numerous theaters in the Nampo-dong Street area, at the Cinema Hall in Millak-dong, and on a giant outdoor screen in Suyeongman Bay. You will feel the passion of these movies and people. Busan Biennale is a comprehensive art festival that integrated three different festivals that had been held in the city: Busan Youth Biennale, Busan Sea Festival and Busan Outdoor Sculpture Symposium. With a long history of serving as an art stronghold in Asian, Busan is a perfect place to host an art festival for the region and beyond. The biennial art event was intended to present an easy interpretation of the hard-to-understand contemporary art and make it more accessible to the general public. The festival serves as an arena where locals can mingle with people from other countries and communicate with each other. Busan Biennale will be entrenched as representative culture event of Korea and ultimately achieve a worldwide recognition. The Busan Jagalchi Festival is Korea’s largest seafood festival. It is held every year in October at Jagalchi Market, one of Busan’s most famous places, and Nampo-dong, located in central Busan. The festival features many things to see including reenactments of traditional fishing folk customs such as Yongwangje(sea king ritual) and Manseonje(a ritual praying for a good catch) as well as various seafood-related hands-on programs. There are also free cruises around Taejongdae and Songdo Islands as well as tours of Jagalchi Fish Market, where fresh sashimi and other seafood can be purchased at discounted prices.